George Leland Elementary’s Space to Grow schoolyard boasts a basketball court, play mounds, an outdoor classroom area and a variety of gardens including a rain garden, a butterfly garden with native plants and edible learning garden beds for vegetable growing courtesy of the Kitchen Community. As a STEM school (science-, technology-, engineering- and math-focused), teachers were particularly enthusiastic about utilizing the outdoor space for their lesson plans, such as taking students on nature walks that incorporate science. 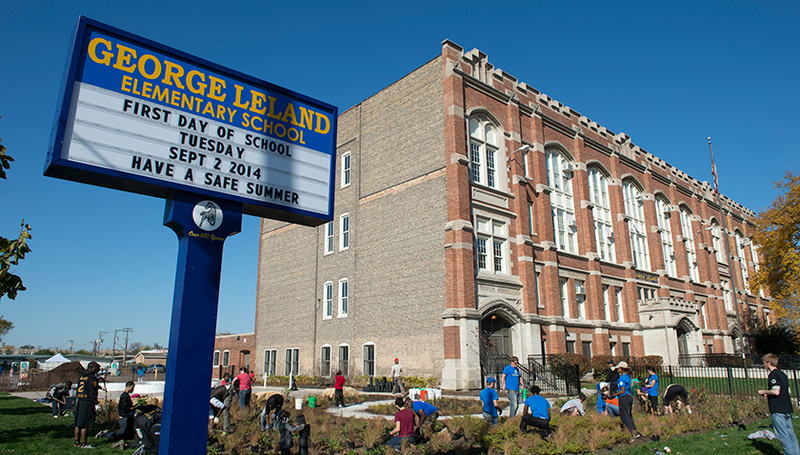 There is a sense of ownership of the space among the staff at Leland because they were involved with the planning and discussed what they wanted to expose their students to. In addition, the gardens have raised nutrition awareness among students, staff and community members. As research has shown, outdoor and garden-based learning can positively impact student achievement and be an exciting part of any healthy school environment. One Leland teacher at a recent professional development training pointed out that spending time outside is integral to developing social, intellectual, and other skills. But it’s not all about using the space for educational purposes—there are plenty of fun activities centered around the schoolyard, too. From the basketball court to the play mounds, kids are running around enjoying themselves and their redesigned space.